Chevy’s small cars have never really done much to impress. The one in most recent memory, the Aveo, was especially dismal. 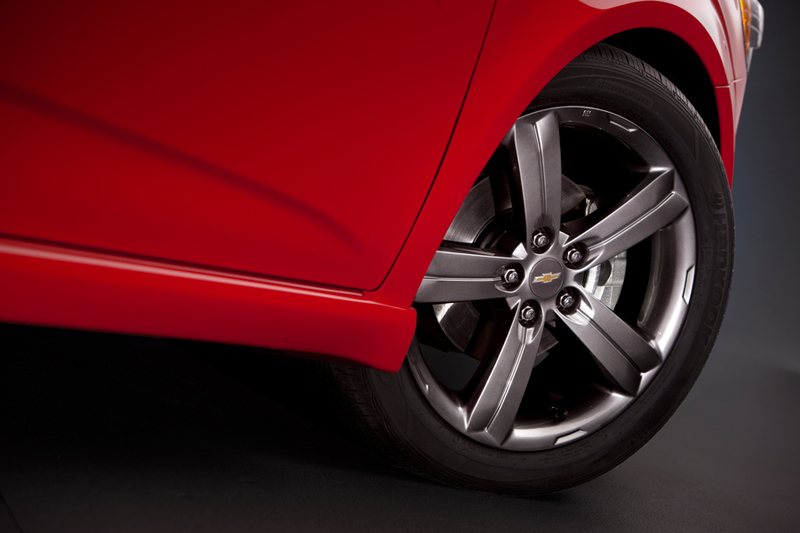 But GM is out to impress and ask for a second chance with a new subcompact that debuted in 2011. 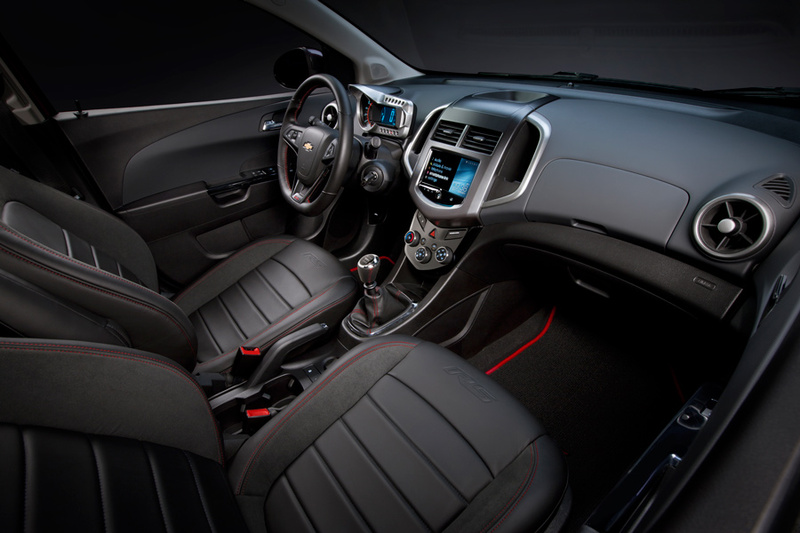 In much of the rest of the world, it’s still marketed as an Aveo, but Chevy must have wanted more of a fresh start with U.S. buyers, so here it is now called the Sonic, and for 2013 customers get the option of the new RS package. This results in a car that certainly looks the part with pretty aggressive styling as well as enough “RS” and “Turbo” badges and look-at-me trim to give it that hot-hatch look. And with a price tag of around $21,000, it also seems like a pretty good deal. The Sonic RS, then, is an eyebrow raiser, but is it more show than go? The Sonic RS is only offered in five-door form, which is a good thing because the sedan looks pretty mundane and a hatchback rear end matches the rest of this car’s boy racer image. It’s not a look for everyone, but it still comes together pretty well. The front fascia is definitely aggressive and distinctive if not exactly pretty, with new fog lights, a bigger grille, and headlamps that are supposedly “motorcycle-inspired”. The rest of the car is also pretty well-styled for what it is, and it especially looks the part riding on those 17-inch aluminum wheels, an appealing change from the caster wheels that we see on so many small hatchbacks. All in all, the Sonic RS looks pretty good and is distinct enough from the regular car without being overdone. Only the RS gets the Jet Black interior, which has leather appointed bucket seats up front. There is red stitching throughout, even on the steering wheel which, by the way, is also flat-bottomed. It’s a cool touch that we’re seeing on a lot of GM cars these days, and we like it. As for the rest of the interior, it looks good and feels good for a car that costs this little. 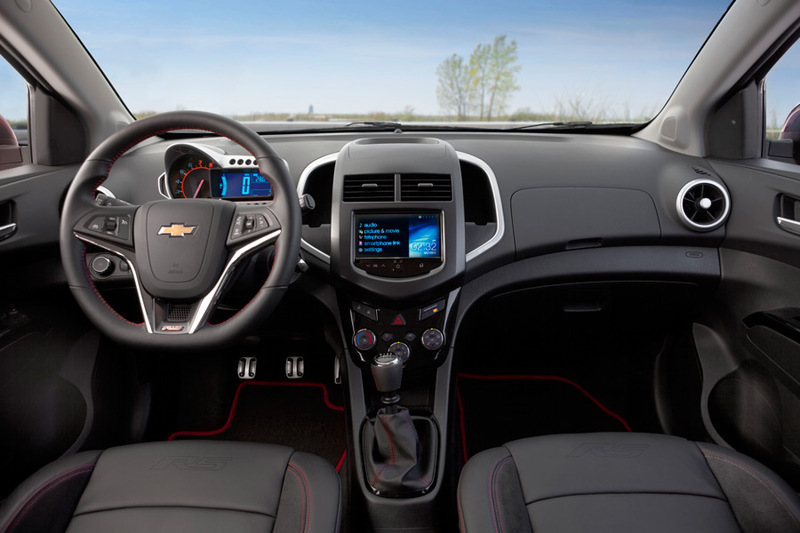 On both the RS and LTZ versions of the Sonic, GM’s MyLink “infotainment” system is standard. It gets you a 7-inch diagonal color screen, Bluetooth streaming audio, voice recognition, and plenty of levels of compatibility. Like always, the MyLink system is easy to use with its simple touch screen format, and anybody familiar with a smart phone shouldn’t take long to get used to it. An app for full-function GPS and navigation is also available. The front seats aren’t the roomiest in the world, but as far as cargo space goes the Sonic is quite impressive. It has more room in the back than comparable cars like the Mazda 2 and Ford Fiesta, and the rear seats fold just about flat for carrying the more cumbersome things in life. There are also storage compartments in the center stack and doors for the not-so-cumbersome things. It all makes for a well-appointed and practical interior, one that somehow manages to feel sporty and rather usable all at the same time. Most Sonics get the normally aspirated 1.8 liter Ecotec four-cylinder motor, but a 1.4 liter turbocharged version of the Ecotec was available in the LTZ model last year and this powerplant now comes standard in this year’s RS. With dual overhead cams and variable valve timing the little turbo makes 138 horsepower and 148 lb/ft of torque. That’s not bad for such a small motor, but for a 2,800 pound car that screams boy-racer it just isn’t enough. It may achieve around 34 miles per gallon on the highway, but from the moment you turn the key, there’s a clear bit of disappointment in the grunt department, and even driving it around town leaves you wanting more power and a better sound (or any sound). The chassis is a good one and could certainly handle it, so it frankly feels like a little something is missing. Or, perhaps, we expected too much based on the sizzle thrown up by the trim package. Our RS test car thankfully had the six-speed manual, but you can also get it with a six-speed automatic. Drive it with some enthusiasm, and you’ll find yourself hitting the 6,250 rpm rev limiter routinely, and not in a good way. We expected a rev-happy engine–and it didn’t disappoint–but the maximum 138 hp comes at just less than 5,000 rpm, yet our gut told us to expect another 2,000 rpm of pull. Then again, it may simply need some work on the clutch arrangement and/or gearing. We also had a tough time getting moving smoothly with the feather-light clutch that lacked feel, a shifter throw that felt inches too long and pedals too far apart for an effective heel-and-toe downshift. At the end of the day, however, this is not a race-ready car, nor should it be, and this part of the Sonic RS only needs some sorting that shouldn’t be too difficult in the next update. Corvette engineers reportedly lent their talents to the Sonic RS’s ride and handling (the engine guys must have been busy). The RS now sits ten millimeters lower than the standard car, and has MacPherson strut front suspension and a twist beam rear axle, both of which have been stiffened for less bounce and roll. The RS is also the only Sonic to have disc brakes on all four wheels, although in 2013 that’s not really something to brag about. Throw the RS around and the chassis holds up admirably, with not too much body roll and a firm grasp of the car’s limitations. While not autocross-ready, the suspension is more than ready for the daily requirements of nearly all drivers. Simply put, the Sonic RS is indeed more bark than bite. The boy racer exterior writes a check that the running gear can’t cash, and that’s okay. It is a fun car, and certainly a standout from many of the other subcompacts (not to mention more practical than many of them), but it’s not as much car as it could be, and it only takes a drive or two to realize it. And if you don’t need a lot of room in a subcompact there are other, arguably much more exciting 1.4 turbo offerings from Fiat at a dangerously close price. The 500 Turbo is priced right there with the Sonic RS and the hugely popular Abarth can be had for only a couple grand more. And even closer to home is the 1.6 liter Ford Fiesta ST, a car that’s also competitively priced and has four doors but packs around 60 more horsepower than the Sonic. The RS is a good and admirable attempt at injecting some enthusiasm into the Sonic lineup and it is a thoroughly usable car with nice looks and a well done interior. But with a few more horses it would be a more serious standout. Chevy’s not quite there yet, but they’re on the right track, so maybe we can expect a Sonic SS in the near future? If Chevrolet is going to keep up in the hot-hatch game, we sure hope so. 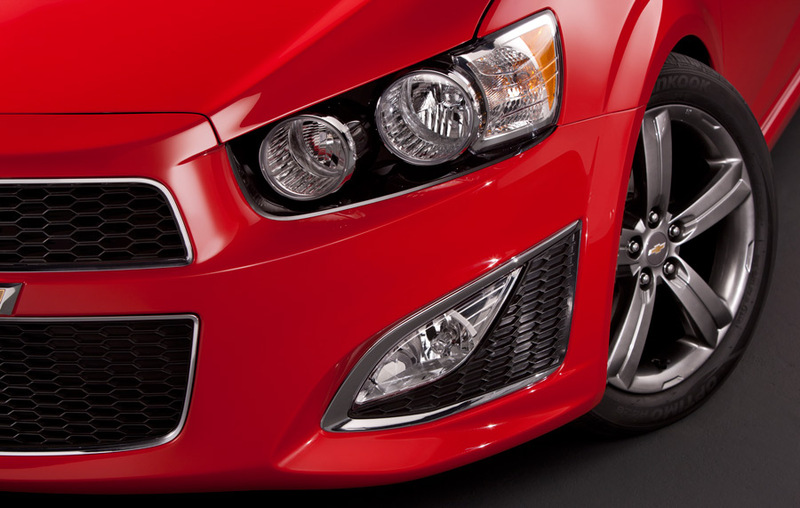 For more information, visit Chevrolet.com.